Caitlin Kilcoin, center, recruited Pizza Tonight’s Stephanie Lebow for a trial run on a new dine-at-home concept. We have food-truck courts, farm-to-table dinners, tasting menus, Kickstarter campaigns, farmers' markets, test kitchens and pop-up restaurants (including the next one, Meddle with Spoons, coming July 22 to Ironfish by Pescados). Now in the world of food trends, Richmond enters the realm of kitchen surfing, in which a chef comes to a private home to prepare a meal for paying friends and guests, getting everyone a little closer to the action. 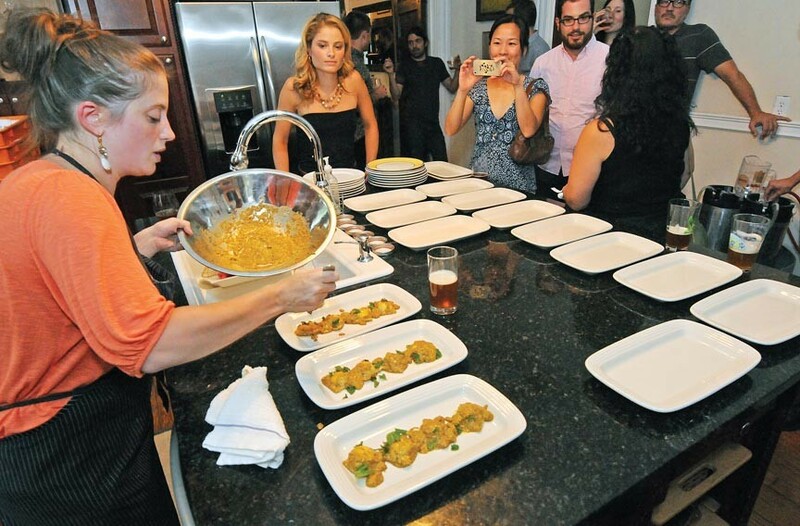 A trial run July 9 brought the kitchensurfing.com guys down from Brooklyn, N.Y., to see whether an elegant Church Hill house owned by Richard Souter could portend a new era in food service here. Organizing the event was Caitlin Kilcoin, who worked with Pizza Tonight's Stephanie Lebow. They hatched a Calabria in Three Courses menu of spicy pickled eggplant and goat cheese focaccia, sausage and fennel ravioli, and almond-bergamot cake with citrus crema, prepared in Souter's spacious kitchen. Ardent Brewery co-owner Paul Karns brought honey-ginger beer, and the group assembled about 40 friends to mingle, chat with the chef and consider the potential for future events. Kitchensurfing.com contends that "food eaten alone is not delicious." The website business takes a cut of the admission price and helps coordinate the chef, the place, the menu and the attendance. They are, according to the site: "building a better way to connect with the people who make the food you love. Bring great chefs into your kitchen; eat the world's food anywhere." The program is up and running in Brooklyn and Berlin, which should make Richmond feel rather worldly. Kilcoin says it's a good fit for a foodie town. One of the guests, Lianna Woods, who works with Tumblr here, sees interest in the idea. "It's encouraging people to get together to talk about food and the culinary industry," she says, "to have chefs and laypeople" sharing the meal and the experience. Will there be more? Kilcoin, who runs the YRichmond campaign for the Greater Richmond Chamber, hints that the next event might be on a downtown rooftop. Mexican Beer and Other Things at Acacia Mid-Town: If there's one restaurant that Richmonders and their guests should experience, chef Dale Reitzer's Acacia should be on the short list for its overall consistency of experience and its quality. An incentive this month is a Mexican beer dinner July 19, and a corkage-fee-free evening with handcrafted dinner July 25, both strong values. See acaciarestaurant.com for details. Keep It Down: Pasture, the ultra-hot, small-plates restaurant downtown that has a tile floor and a noise level that makes for some hoarse throats at the end of an evening, has installed a solution. Manager Michele Jones says ceiling panels have just been lowered to hold in some of the decibels. Being popular is a mixed blessing, as restaurateurs have learned at Stella's and elsewhere. Noise and the chattering of excitable crowds are entertaining to some, annoying to others, and the guys who help ameliorate it are doing good business. Phil's Fan Call: Look for ladies' nights on Fridays and Saturdays at the relocated Westhampton classic Phil's Continental Lounge, 5810 Grove Ave. Owner Kyle Measell is running drink specials to bring in the summer crowds, along with karaoke on Thursdays from 9 p.m.-2 a.m. 288-8687. Guided by 2113 co-owner Justin Ayars, Mayor Dwight Jones samples the grand opening spread. 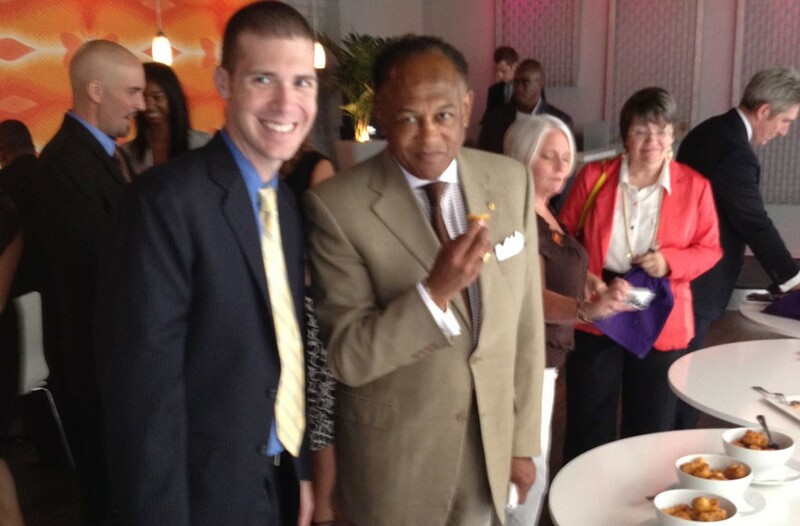 Dwight Jones blessed a pimento-cheese fritter with an approving mayoral bite during the grand opening of East End bistro and lounge 2113 on July 9. The leader of the First Baptist Church of South Richmond had given the place a thumbs up, boasting of having a drink named after him at the bar. That tells you how comfortable his congregation is with socializing, the mayor and minister joked. As co-owner Justin Ayars explained later, the bar sometimes christens cocktails with an honorary name for a patron, though none has made it to the printed menu. And it's a menu that's been changing. The restaurant 2113 opened less than five months ago in a vacant former jail cafeteria that underwent a two-year overhaul. In late May it was pummeled by a one-star review in The Richmond Times-Dispatch just as it was readjusting with new kitchen heads, unveiling changes by consulting executive chef John Maher — who doubles as house DJ — and chef de cuisine Aaron Hoskins. Along with pimento-cheese fritters, the chefs offered tastes of hamachi crudo — pickled mushrooms, radish, fennel pollen and dashi vinaigrette — and pan-roasted duck breast with braised greens and vanilla-glazed Tokyo turnips.